A new TV spot for Star Wars: The Force Awakens arrived last night during the Fall finale of The Walking Dead Season 6. And while it runs a full one-minute in length, we get only one new brief shot of Finn going up against a TIE Fighter in the Millennium Falcon. Another 30 second spot arrived later on in the night, which has Kylo Ren on the attack, going after the new members of the Resistance. It doesn't contain any new footage at all, but puts existing footage together in a thrilling way that's fun to revisit. Over the weekend, we got the second Star Wars: The Force Awakens Disney Channel preview, which focused on Daisy Ridley's Rey. Now we get the third behind-the-scenes featurette, which offers new insight into Finn's adventure. John Boyega was on hand to talk about his character, and show a few select scenes from Star Wars: The Force Awakens. 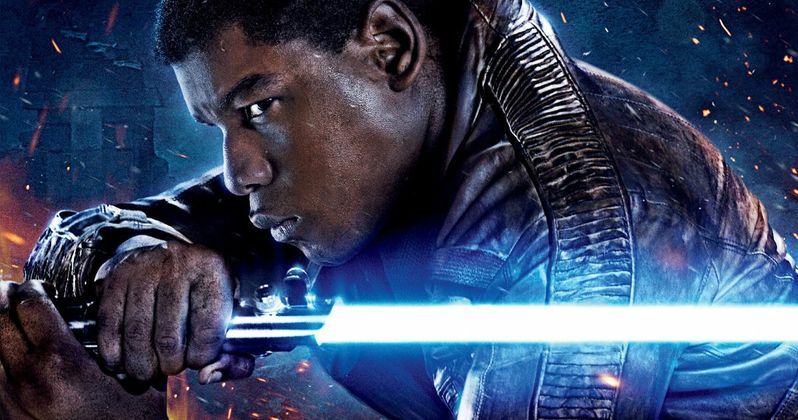 This includes a shot of Finn walking through the deserts of Jakku, stripping himself of his First Order armor. We get to see the Millennium Falcon on an ice planet. And there is a new shot of Finn's TIE Fighter coming under fire from a Death Star. Here's what the actor had to say about joining this universe. "Finn is a Stormtrooper. There is this feeling in him that I want to mean something more. I want to find the good in myself. So the decision is to leave his Stormtrooper days behind. That leads him to meeting Rey. And they embark on this journey together. We had to run away from a few huge explosions, and it was insane. Every day we are filming the most vital scenes to the Star Wars universe. And we're having fun doing it." With just 19 days left until Star Wars: The Force Awakens hits theaters, new tidbits of information are revealed almost every day. We learned earlier this week that the MPAA has given this adventure a PG-13 rating for "sci-fi action and violence," which will help ensure that the widest audience possible will get to see the movie when it arrives December 18. This highly-anticipated adventure has already broken box office records, weeks before its debut. The film has brought in over $50 million in advanced ticket sales, shattering the pre-sales record of $25 million held by 2012's The Dark Knight Rises. Some early estimates claim the sci-fi adventure could earn more than $300 million in its opening weekend, which would shatter the $208.8 million record set by Jurassic World this summer.